This has been one heck of a week! The Fiasco has been dealing with some trouble at work, my mom came to visit for a few days, I’ve had multiple job interviews, and I’m preparing for my Rhinebeck trip tomorrow.. Phew! With all the craziness I’ve only done a little bit of knitting but here it is anyway. My bulky vest is still unseamed but I did dig out the perfect matching yarn from my stash to seam it with so I’m counting that as progress. 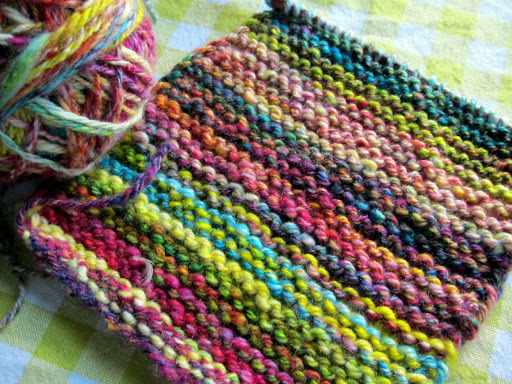 The yarn it’s knit with would be a bad choice for seaming because it is extremely thick and as a singles-type yarn it would be difficult to manage. The matching Cascade 220 is a lighter weight with multiple plies and a tighter twist so it should make the sewing up go more smoothly. I had wanted to finish this thing by Rhinebeck so I’m rewarding myself for getting through this week with ignoring the rest of the world and finally getting back to this sweater. Let’s see how much I finish before I leave tomorrow, shall we? The main parts of my mitts are finished! These were intended to be a holiday gift for my mom, but when she came to visit she appropriated a pair I had already made so now I don’t know where these will end up. That green spot is holding stitches for the afterthought thumbs I still need to add. 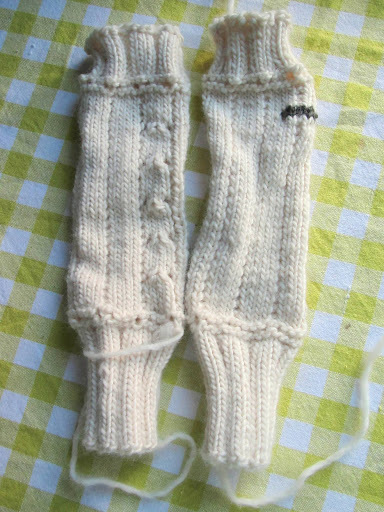 I also need to knit the i-cord that will lace these up. I’ve started the i-cord twice already, one in a worsted weight yarn that felt too thick for the Malabrigo and again in some sport weight Bugga. However, I’ll probably have to start again once I figure out who these are going to so I can choose an appropriate color. That’s the great thing about knitting these in a neutral to begin with, they’re easily customizable! 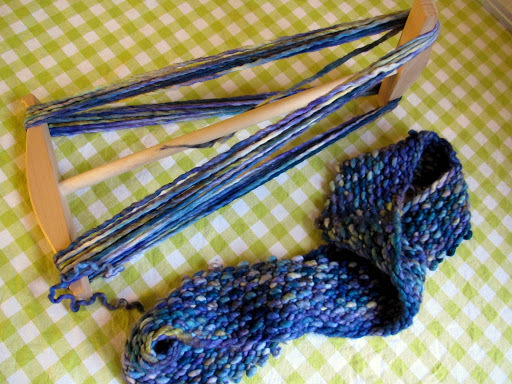 If you’re interested in knitting some for gifts this season (or for yourself) you should come join the KAL on Ravelry! You can knit either the wristwarmers/mitts or the hat (discount code in KAL thread) and if you finish before December 31st you’ll be entered to win a $20 gift certificate to either Cephalopod Yarns or The Verdant Gryphon. I’d love to see what you make! I’ve had two of my design submissions accepted for the Afghans For Afghans charity e-book being put together by Cephalopod Yarns and Cooperative Press, which I’m super psyched about. I’m not sure how much progress I’ll be able to share along the way but since this design currently consists of a garter stitch square I figured it was safe, if a bit boring, to show. But what a pretty, pretty square, amIright?? Destruction can feel weirdly good. I never wore this old cowl I made and was seriously itching to cast on another of my upcoming Syrinx cowl design, so I frogged it, skeined it, washed it, hung it for days (bulky yarn takes forever to dry!) 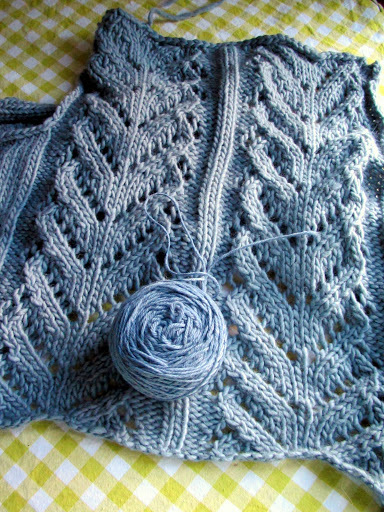 and am finally reknitting it. 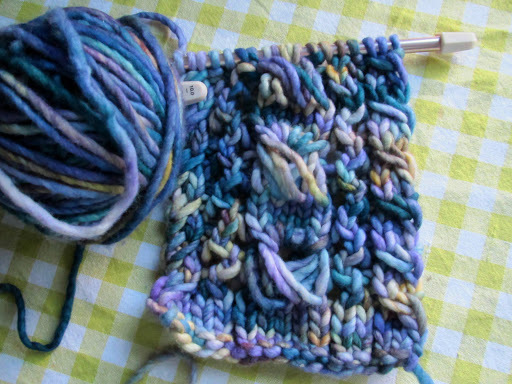 I am amazed at how well this super bulky Merino frogs and reknits. It looks like new! It must be because it’s partially felted to begin with. Whatever the reason, I adore it. Alright, I think that’s all I’ve recently worked on. Be sure to check out other WIPs by clicking on the photo below. **ALSO**: if you are going to Rhinebeck, you can check out my brand new Huacaya hat design in person at the Burgis Brook Alpacas booth in Building 35. The patterns will be for sale in the booth and available digitally on Sunday 10/21. I’m still very excited that one of my designs will be at Rhinebeck so I’m sure I’ll be hanging around the booth a bit, come say hi! This entry was posted in festivals, MyDesigns, WIPWed by shoelaceswitcher. Bookmark the permalink. What a lovely hat. And you didn't get much done? I would think otherwise! All of your current projects are once again super lovely and amazing 🙂 Good luck seaming and have fun at Rhinebeck!